Spice up ordinary picnics with these extraordinary indoor or outdoor picnic tables. Constructed with medium-duty and heavy-duty commercial grade aluminum materials, these tables are weather resistant and rust proof making them the premier choice for cutting edge office areas, gardens, parks, stadiums or universities. 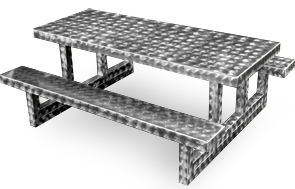 Models are available in multiple lengths and aluminum thicknesses so you can find the appropriate picnic (party) table for your environment. Choose from a wide array of vibrant Powder-Coat Color Options (choosing "None" in the drop-down menu for color will produce a basic glossy aluminum look). 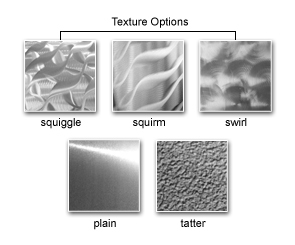 For a more creative and stylistic finish, add Textured Designs of Swirls, Squiggles, Squirms, Plain, or Tatter coated with a clear powder-coat finish that creates a shimmering glossy appearance. Both medium and heavy-duty models are supported by 3" x 3" x 3/16" portable frames for maximum durability that will last for years.